“My dog lies!”… I hear this all the time when I’m judging and teaching. When I’m judging, I see a dog indicate on the correct box. The team apparently has a history of mistrust because the handler will tell the dog “You lie. Let’s check the other boxes.” IF the team is lucky, the dog will come back and reindicate. At that point the handler finally believes the dog and calls “Alert”. When I hear this phrase while teaching a seminar, the comment, “My dog lies” usually happens close to the sentence “I want a stronger alert”. If you find that you’ve used these sentences, this blog is for you! In fact, I’ve heard this comment SO many times that I sometimes share the following slide in my seminars. 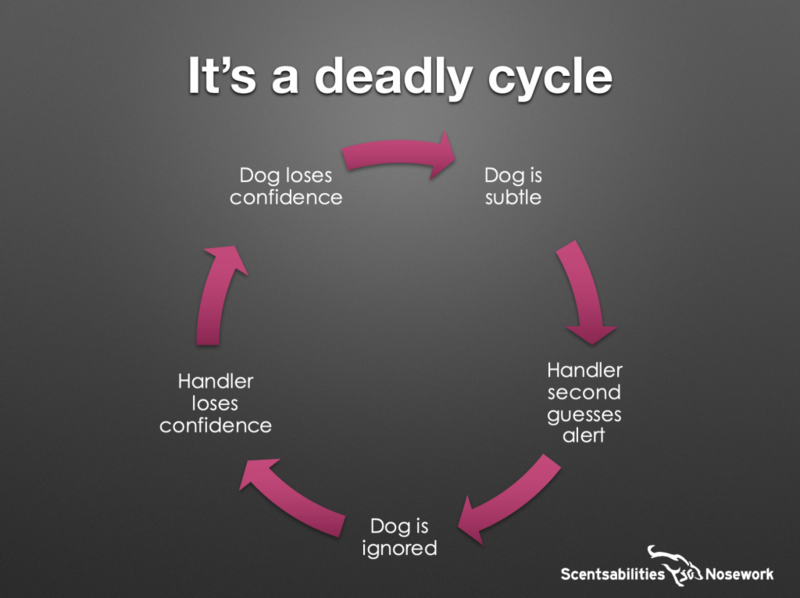 This is the deadly cycle of subtle alerts. If so, we need to alter your thinking a little. We need to break the cycle, but the answer is NOT a stronger alert. Dogs do what they are reinforced for. Occasionally a dog will make a mistake that might point to a hole in their training or capabilities. The word, “Alert” never comes out of the dog’s mouth. So if you are reading this, you might be wondering, “Ok. Now what?” Let’s talk about the first step. Call Alert, even if you think your dog is wrong! It’s incredibly important to believe your dog EVEN IF YOU THINK HE ISN’T CORRECT. That’s right… risk the Q! The thing is, your dog’s long-term confidence in his own searching ability far outweighs the importance of that class or that search or that title. It’s essential to prioritize your faith in him, even if he is wrong, over passing the search. You see, your dog is learning too. He’s not infallible and he wants to do his best. If you question him, he will question himself. Once a dog starts to question his own abilities, you are headed down a very deep, dark hole that is difficult to crawl out of. I did just this this past weekend with my Standard Poodle, Joey. Joey was competing at NW3. In NW3, you don’t know how many hides there are and you have to pass all six searches in the day in order to title. Joey is getting older (he’s 11.5 years old) and the pressure is on! Our first searches were Interiors. We performed all three interior searches, calling Finish after finding one hide in each room. Although in NW3 you don’t know until the end of the day if you pass, I had a very good feeling that we were correct! Our second element was Vehicles, Usually Joey is strongest on Vehicles and Exteriors. He quickly found the first hide. As he came around the second vehicle he caught odor and wrapped around to the back of the vehicle. He very clearly alerted on the hitch. Unfortunately, he was fooled by blowing odor that got caught up on the hitch assembly. We got a “No”! And you know what? It’s ok! We will get to try again. In the meantime though, I trusted him and I called Alert when he clearly thought the hide was on the hitch. I never second guessed him and I have to say that I would make the exact same call today. Our mutual trust and his self confidence is far more valuable than a title ribbon, even at NW3! So…. if your dog Alerts… CALL IT! The second thing you can do if you feel that your dog is hard to read or is subtle, completely eliminate blind hides from your training. You will as a result, start to always reward your dog at the hide. You will find that it becomes easier to read your dog, and your dog’s self confidence will blossom because he will have a clearer understanding of when he is correct. That self confidence will result in “stronger alerts”. Couple that with an improved ability to read your dog, you have the formula for a successful team! So go out there and TRUST YOUR DOG!! I am having this issue, I do ever say the dog is lying, I know I am not reading the dog correctly! I am going to do what you suggest and no longer do any blind searches so she will be rewarded at the Hide. Hope this helps her trust me. Thank you for letting me know it’s okay to stay with known hides for a good long while. Marcia, blind hides are highly overrated!!! My issue is an example in containers….dog goes straight to one article sniffs but does not alert. Goes to next article and sniffs and again no alert but really sniffs. I redirect back to first sniffed article and ask is it here then back to second one. Dog sniffs hard on each and then looks at me walks to third article and gives strong alert even after not sniffing it. I ask is it reaaaly here and dog give strong alert. I call and no…it was second article. If that is that case then you definitely DO NOT want to be doing blind hides. 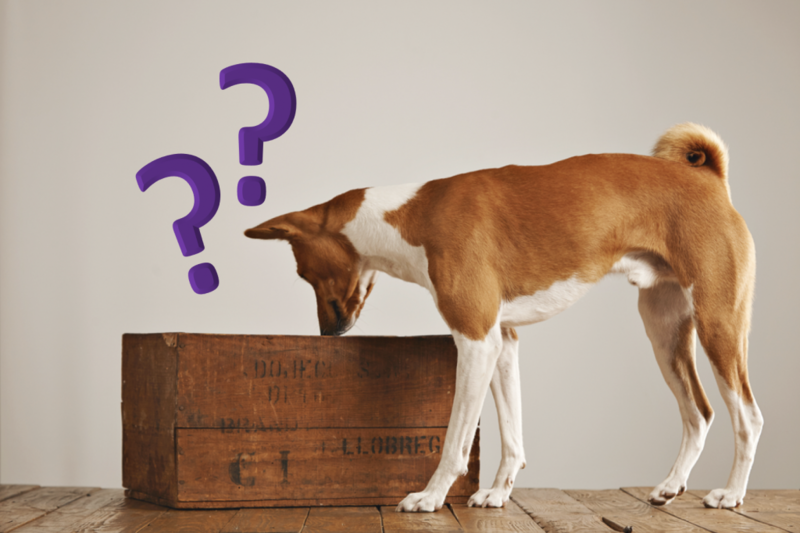 This is a case of the dog being thoroughly confused as to what you are looking for. Go back to known hides and reward the first sniff on the hot box. Make sure you are rewarding BEFORE the alert happens. It’s very possible that your dog believes the act of alerting brings the cookie, not the act of finding the hide. In my training I was taught never to ask your dog ‘where is it’ or ‘is it here’. The second you ask your dog for the alert behaviour, you are going to get a false alert. This is so well written! May I share it with my students? Some get very hung up on titling and forget it’s about their relationship with their dog. Braves, Stacy! Oops—that was supposed to be Bravo! Thank you so much for this timely article. Our dog started out so well but will now get confused on the alert. We are going back to blind hides. He loves scent work. I’m assuming you meant “going back to known hides”? And yes! If he’s confused, that is absolutely the correct thing to do! Ouch – that’s a phrase I hate to hear and your article is spot on. Trust works both ways. Going back to known hides lets handlers understand what they are seeing from their dogs. Sometimes even going back to paired hides is helpful for this. Good article, Stacy. Thanks for permission to share. I was hoping you’d put something out about this. I’ve been doing NW with Wilson for 6 years off and on. He’s done great. Just lately he’s started to occasionally false alert, recently in an ORT. He is a very smart boy and often tests rules. I think as his alert behavior has developed and strengthened, that he has started testing whether it’s the “sit next to A box” behavior or the “sit next to THE box” behavior that gets the treat. Your suggestion to stay with known hides for a while and reward as soon as he sniffs at odor should be just the thing to help him work that out. He’ll be redoing that ORT early April and trialing for NW2 at the end of April. We’ll be fine and, thanks to you, I now have some clarity in how to help get this sorted out. Thanks! Dee, it sounds like he’s confused as to whether the cookie is a result of finding odor or the result of sitting. What I would suggest is do known hides and reward him BEFORE the sit. He needs to make a connection between odor and the reward. Thanks for this post, Stacey. One concern, which occurred to me last week as we were searching known (container) hides, is that I might inadvertently “steer” my dog (my leash pressure) to the hide, rather than letting her find it. Your thoughts, please. That’s a good concern! Focus on staying well back from your dog and letting her lead and you’ll be fine! So what should you do when you send your dog out to search known containers and the dog gives a false alert? One thing I would suggest is videoing your searches… you might find that it’s a handling error! Your course of action will vary depending on the cause of the false alert. Are you working with an instructor? Thank you as always for taking the time to put your observations into such a teaching blog. This is a must read for anyone doing this activity, whether for fun or sport. All true. Hides are always blind to the dog, no need to have them blind to the handler as well. Video, video video – and then convert it to slo-mo! You will see things that you very well may not see in real-time. And give your dog room to search, don’t add additional body pressure! I agree 100%!!! Yes! Please share away! Thanks for this blog Stacy. I’m having this issue with my second dog, Cupcake. I don’t trust her and she doesn’t trust herself anymore. I always do known hides, but. trialing is another issue.. Acutually, I was almost thinking of quitting nw totally. We need to rebuild our mutual trust. Hey Francine… I’m going to email you about Cupcake. I think I can help… At the very least maybe we can talk in depth when I see you in Stockholm on May. Hang in there!! I’m so glad I saw this blog post before our NW1 trial today – our second attempt. I’ve been working on getting a stronger alert from my dog and had a plan for the trial to wait until I got it. Your post made me decide to just trust my dog’s alert and reward her right away. So what if we’re wrong? Well, that strategy worked for us! We earned our title and took 3rd place overall!!! Thank you for your timely blog post! I’M INCREDIBLY HAPPY FOR YOU!!!! Congrats!!!!! I too am having an issue with alerts. Not false alerts, she just doesn’t seem to know what to do when she finds the scent. In the past she would always give me a sit, and a stare, was very consist ant with the alert. Lately she seems confused.. I started her over today, just at a box, having her put her nose in, and treating her from myhand, that is also in the box. I think what you mentioned, the trust issue… When she false alerts, my instructors suggest I do not feed.. Perhaps I I should! Yes! That is exactly what happens! You are completely correct that this can result from too much pressure or from rushing training. Do you still give the dog the reward?